What a gorgeous few days we've had in this part of the world. I think we've spent most it outside enjoying the sunshine (and watching U14s cricket semi-finals), although the girls and I have just cooked up a storm in the kitchen. They love playing 'Junior Masterchef' and experimenting with all kinds of different ingredients. Akk – what a mess, but HEAPS of fun. I hope you're having a special weekend in your part of the world too! 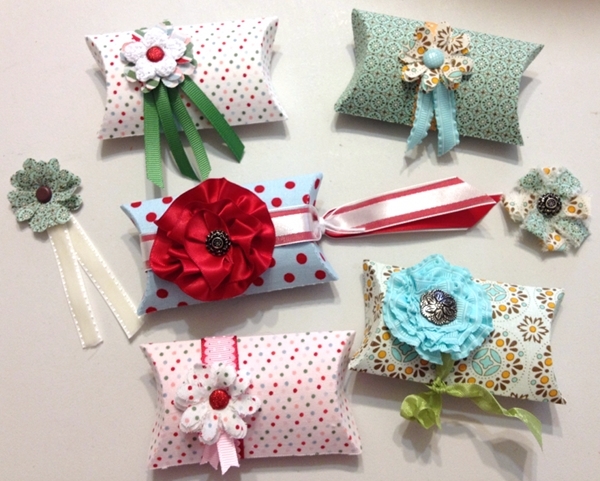 Now, I have to share these fabric pillow boxes with you. Oh my goodness, I LOVE these! They feel so good! lol. This was one of the projects we made at Stamp Club this week. 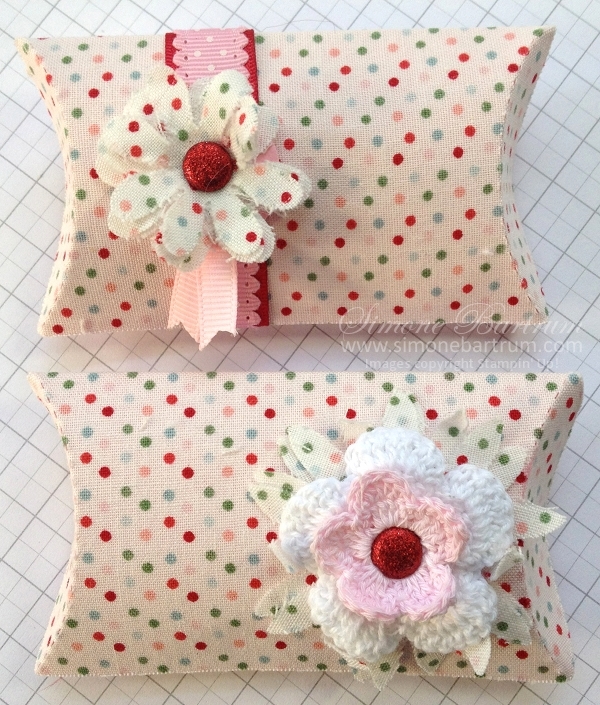 Pillow Boxes made with Candy Cane fabric, embellished with Real Red satin ribbon, Pretty In Pink scallop dots and narrow grosgrain ribbons (above) and plain & dyed Fleurettes crocheted flowers with red Glimmer Brad. Click to enlarge. This project was recently shared as a video on our demonstrator forum (demos: check out the Stampin' Connection videos for all the deets), but we changed it slightly. To make these, simply adhere the fabric to cardstock using the Multipurpose Adhesive Sheets (p155 Idea Book & Catalogue) before running it through the Big Shot with the Pillow Box Die. The cardstock gives the box its shape, while the fabric adds great texture and it really feels fab to touch. Mmmmm. Note: In the pillow boxes above we used Pretty In Pink cardstock, and it's interesting how the colour shows through the fabric to change the look a little bit. It really looked quite different with White cardstock, and I'd love to have a go with another colour under it like the matching Garden Green or Baja Breeze. Yum. The evening club used the lovely Spice Cake fabric. The Spice Cake suite of goodies (including the matching 12×12 paper, stamp set and jumbo buttons) are all finishing up at the end of this month when the Summer Mini Catalogue expires. Sob. One of the super talented demonstrators in our group, Sherridan, made all these gems with fabric. Oh WOW. How cute?! I just adore the huge satin ribbon rosette in the middle there with the red spotted fabric (also from Candy Cane Christmas). Oh My. There's one more project which is nothing short of spectacular… I haven't taken a photo of it yet but will do that tomorrow and will upload it here. I'll give you 3 hints: owl, fabric, paper. Yep, 3 of my favourite fun things in the world! 🙂 Woohoo. Stay tuned. Edited: Here's that link.